Pyrotect Racing Suit - Pyrolite Two UNIVERSAL - Dezod Motorsports Inc - Home of the automotive performance enthusiast since 2002. This newly redesigned series of suit offers high style, greater arm movement, premium construction techniques, and eliminates the old fashion “amateur” look-alike features of patch pockets, loose belts and stripes. 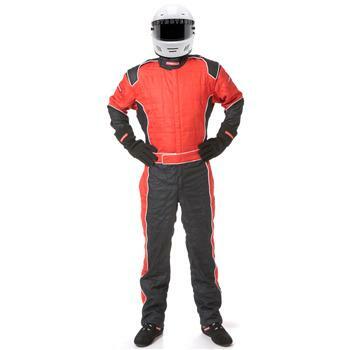 Excellent for all types of racing requiring SFI-5 suits. Two Layer, 1 piece, Lined, SFI-5 Nomex IIIA. Five color Nomex variations with accent colored piping, knit collar, knit rear waist expansion panel, epaulets, slash (lined) pockets, attached belt. Matching color knit cuffs. Excellent 360°arm attachments for excellent arm mobility. Recommended for cooler climates or evening and drag racing.